Cabin at 5255 W. Lake Blvd. Homewood, CA 96141. It's 6.5 miles south of Tahoe City on Calif. Hwy 89, The first residence on right past the ski hill. We have wireless internet (Wi-Fi) thru a cable modem (Behind the TV) and wireless router (on the table by the wall in the kitchen). The stereo is by the deck door. There is a switch to turn on the outdoor speakers. The knob is not fictional. It is equipped with Chromecast Audio to play music thru cabin speakers from your mobile device. Turn thermostat in kitchen bookshelf to 65-68°. See Heat below. 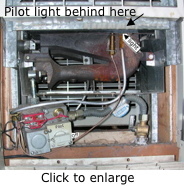 If heater does not come on check that the pilot light is lit (see below). Turn water heater Temp. to Hot or slightly higher (much higher and water can be scalding). Turn large red dial at the bottom front. If there is no water it may be shut off or frozen. The outside water valve to the right by the floor should be off in the winter so it does not freeze in the outdoor pipes. There is a snow shovel on the back deck just around the corner from the front. Another is hanging under the roof on the side of the garage. Turn off heaters in back bedroom and hall by ladder to loft. Unplug heaters in back loft. Set bathroom thermostat between 1 and 2. Leave doors to laundry & bthrm open so heat can circulate and prevent the pipes from freezing. Lock outside doors including dead bolts on side and back bedroom. Lock the knob on the front door as you leave. Take trash to cans in bear-proof container and be sure the bear bin door is closed securely. Empty water from humidifier so element doesn't get moldy. You can lift the levers up a bit to make them easier to turn. Don't lift more than 3-4 inches or they will come off. Normal Winter configuration with inside water on. Above. 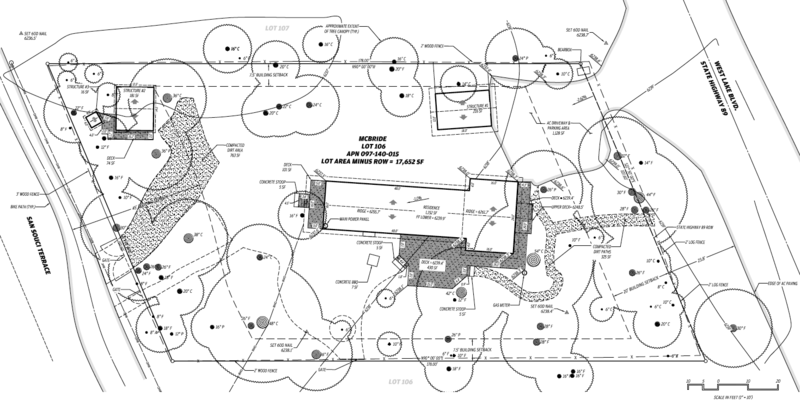 open the 2 outside drains (see Plot Layout below) and open all the outdoor faucets. When transitioning from winter to summer do the reverse of the summer to winter transition. Close the outdoor drains and faucets and turn to irrigation valve on. See also Plot Layout below. There are some binders by the old radio on the shelf in the kitchen which may have a copy of these instructions (may be an older version), maps, guide books, etc. See also the Tahoe West Shore page. In the pantry you will find paper plates, napkins, and so forth. There are even some citronella lanterns, if you wish to dine outside. Please use the vinyl tablecloths provided for the big table- there are several sizes, as marked, depending on the number dining. All are located in the pantry. Extra dining table leaves are located in the closet in the living room. There are also three red checked cloths, for the picnic table, the round table, and the funky square table in the yard, if you wish to use them. If you haven't cooked at altitude, remember to adjust oven temperatures upward by about 25 degrees. Beds will be unmade when you get there; see information on sheets below. There is an extra charge for cleaning linens ($20 per bed). Alternatives are washing and folding them yourself or bringing your own. Leave beds as you found them - unmade. We have plenty of pillows, blankets and bath towels. Back bedroom has a king size bed and a twin. There are sheets are in the closet on the right looking toward the door. Back Loft: A "quaint" loft with 3 small mattresses. It is accessed by a "ships" ladder, or more conveniently, a disappearing stair pulled down from the laundry ceiling. Young kids like this room a lot, but the ceiling is low, from an adult perspective. It accommodates 2 to 4, depending upon how you arrange the cot mattresses. There are a couple of fleece sleeping bags up there also. Living room has is a queen sofa sleeper (gold color). The bedding is located in the cupboards above the bookshelf in the dining area. Additional blankets are located in the closet near the opening between living room and kitchen. Upstairs, the front bedroom has a double bed, and a twin. Although not as peaceful due to street noise as the rear rooms, it does have lovely sunrise glimpses of the lake. Two new bedrooms, bathroom and shower across the hall has a double bed, queen bed and daybed which serves as a sofa, single bed or double in the big bedroom. The smaller bedroom has a double bed . Sheets are in a cabinet. You may be able to find the names of people who will help you shovel or dig your car out on the bulletin board at Obexer's Market across the street. The thermostat for the wall heater between the kitchen and living room is by the pantry. We usually set it at 65-68° during the day and lower it at night. 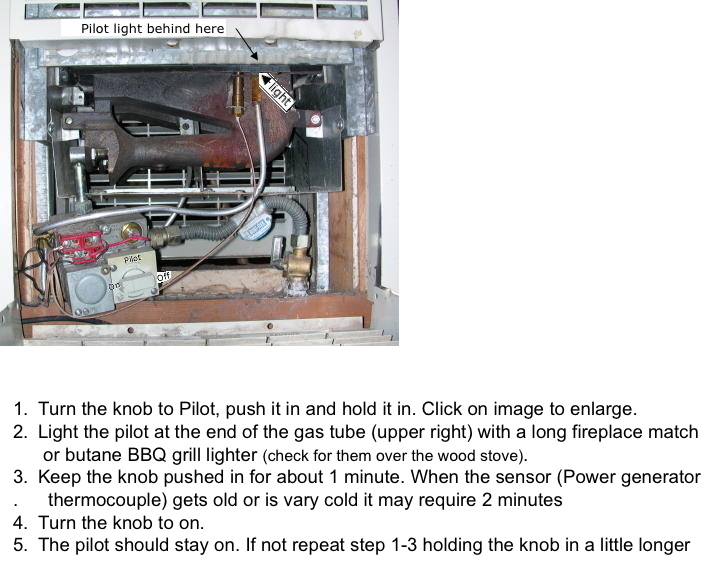 If it doesn't come on check the pilot light (see below). New (South) bathroom - Turn wall heater heat setting from 1 to 3 or 4. Back bedroom - Turn wall heater from off to on (indicator line straight down NOT to Fan). Adjust thermostat if necessary. It slow to reach a given temperature because it keeps coming on and off. You may set it all the way to the right (Continuous) so it will run continuously until it is achieves a comfortable temperature and then set it to the appropriate temperature. The rear rooms all have individual wall heaters, except the North bath, with the claw foot tub, which has a heat lamp, and picks up some heat from the front rooms. The heater for the rear loft is located on the wall to the left of the door to the rear bedroom. The heater for the rear bedroom is located to the right of the back door. Both of those heaters must be turned on, (left knobs), and temperature adjusted with the right knobs. For additional comfort, the front bedroom has an overhead fan, controlled with a switch at the top of the stairs, on the right. The three speeds are controlled by the pull chain. If the pilot light gets blown out the gas will be shut off at a valve under the heater. Open the door in the bottom section of the living room side of the heater. The pilot light is hard to see; You have to look up from the floor to see it behind the metal cross piece. You will see the bottom of the flame and hear a hissing if it is on. Turn the knob to Pilot, push it in and hold it in. Click on image to enlarge. Light the pilot at the end of the gas tube (upper right) with a long fireplace match or butane BBQ grill lighter (check for them over the wood stove). Turn the knob to on. The pilot should stay on. If not repeat step 1-3 holding the knob in a little longer. If it doesn't stay on it is probably a bad thermocouple/thermopile/Power generator. You can get a replacement at Swigard's hardware in Tahoe City. Get a universal 600/750 millivolt Power Generator. It is like a thermacouple which generates power. See gas heater systems. There should be plenty of wood for your stay, located to the right of the wood stove under the stair. If you run low, more is located on the back porch, under the canvas to the right of the door as you go out. 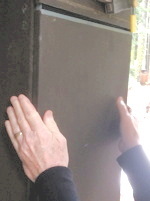 The wood stove also has an output regulator, located behind the brass door on the right of the stove. Once lit, keep it on low, (lever up), or the front upstairs rooms will be quite warm. Even so, you may find that you want to keep those doors closed as a means of temperature control. Dale likes to lay on a bigger log for overnight, to allow for some coals to help start the morning's fire. There is a "Chimfex" chimney fire extinguisher, which looks like a highway emergency flare, by the fireplace. If there is a chimney fire you pull the black tape to remove the end. Then use the abrasive striker on the end to light it like a match. Put it in the stove, close the door and move the lever up to the blue section to minimize oxygen. 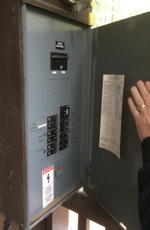 There is an auxiliary breaker pannel by the stairs up to the back loft. The main shutoff is on the south corner of the back porch. To open you have to lift the latch at the bottom and lift the front cover. If the hinges are rusted and it won't lift you may have to get a screwdriver and hammer up on the hinges. The garage flood motion detector light should stay on for 10-12 minutes after the last motion. If it doesn't go off you need to unplug it for 40 seconds then plug it in again. The plug is above the left hand side of the bench on the left in the garage. There are candles in the 2nd drawer of the table by the wall and on the shelf over the radio in the kitchen and other places around the house. Flashlights should be on the top shelf over the cabinets by the deck door in the kitchen and on the hearth of the fireplace. There are butane fire lighter sticks around that work better than matches. (The auto lighter on the stove won't work). There is a wired touch tone phone behind the couch by the TV. Cordless phones won't work. Move some of the blue ice packs from the freezer to the refrigerator and avoid opening the refrigerator too often. There is a green 320 W (18 amp-hr @ 12v) jump starter/power supply PowerStation in the back bedroom. It will run a 25 W laptop for about 6 hrs., a 60 W light bulb for 2.5 hrs. or a 135 W TV for 1 hr. It has both 12 V cigarette lighter output, a 110 V AC output and a light. It can be charged from your car or an AC outlet when the power comes on. If you use it remember to recharge it afterwards. The last power outage I encountered, from a downed power line during a snow storm in Nov. 2008, lasted from 8PM till 11 AM the next morning. There are beach chairs and lounges overhead in the garage. Please enjoy the deck fire-pit and the backyard fire-pit! Just do not leave the fires unattended this dry year, please. There are marshmallow roasting sticks near the little turquoise cupboard in the outdoor kitchen area. If you want to roast hot dogs, there are stainless roasting forks hanging on the wall near the water heater, in the little alcove between the kitchen and laundry. There Black Bears around. They are afraid of people, but if you leave food out they will come and get it. If you leave the door by the deck open when no one is home they will go right through the screen door and help themselves to what they can find in the kitchen. Conserve energy but be comfortable. Don't leave doors open with no one home. Bears don't knock. Don't leave fires unattended outdoors. You will find brooms and other touch up necessities in the utility alcove across from the pantry. Barbecue tools are hanging there,too, next to the aprons. Light bulbs are located in an antique box, and cracker tin, on the second shelf, on the right, in the Laundry hall. Wood for the outdoor stove is located under the turquoise cabinet next to the house. It's great to crank it up for pancakes on the griddle in the morning. The cabinet houses most necessary tools and utensils. Takes some getting used to the facilities, but everyone seems to enjoy it. Worth noting that, cooking outdoors or in, allow extra time for the altitude! There is an old touch tone phone that works when the power goes out behind the couch by the TV. See lot & building info.